"Merrywell" A Horse Lovers Haven. You will have a front row view of a working horse farm from this private guest house on the edge of Country Life Farm's Merryland Thoroughbred Nursery. "Merrywell" a 3 bedroom, stucco on stone historic house dates to the early 1900's. 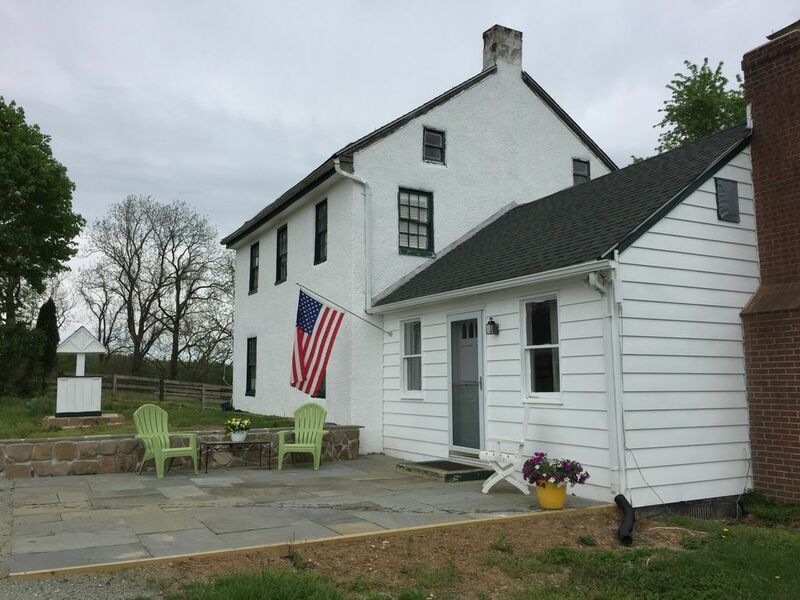 Although you might just want to stay in and enjoy the pastoral views of this conserved property in the Long Green Valley, it is a close drive to all the major attractions of the baltimore area, 10 miles west of Towson and just over the hill from Bordy Vineyard. The base price is for 4 guests, additional $20 guest fee per night for over 4 guests. One night bookings are allowed for Country Life partners. Well behaved pets are considered but must be mentioned at booking. Pets must be in a flea preventative program, not left unattended longer than 2 hours unless crated and be on leash when alongside the horse pastures. When not busy helping out at Country Life. I'm a freelance photographer, artist and addicted DIY-er. I work hard to make the house a comfortable place to relax and unwind. I look foward to making your stay a memorable one that exceeds your expectations. Merrywell's farm setting is a unique lodging alternative for the Baltimore region. toilet, combination tub/shower, Is a central location for easy access to all the bedrooms. Oil Burning furnace. Baseboard heat in the Living room. Galley style kitchen is fully stocked for cooking and entertaining. The Tv is basic Air TV . There is a a Roku set up for Major streaming networks . Netflix, HBO GO, Acorn, Espn and TVG. Farm tours available upon request. Getting up each morning literally with the birds, coffee cup in hand and the horses slowly appearing over the rise- it’s a gift . A tour of the farm , friendly and informative staff, beautiful horses and watching two year olds learn how to ride the track— horse racing becomes so much more than the race. A great experience. My wife and I and one of our adult children and her boyfriend stayed at the home for three nights. The setting of this home is definitely the highlight, as Merrywell is private, quiet, open country at its best. I don't think there was a another person within a half-mile of us. This was my first visit to the area and it is really beautiful. I'm not into horses, but watching them run around the open spaces was pretty neat. There is a lot of positive history about the area and the home, and that is nicely on display inside the home. If you like dark, star-lit nights, this is also your place! The home is as advertised...neat and clean with fully-functioning amenities. There is plenty of common area space, with the separate living and dining rooms. There is also the enclosed front porch area that has two additional beds if needed. Ellen was very responsive and flexible, and easy to deal with. We will likely be in the area in the future and will definitely be staying at Merrywell again! Greg thank you for your lovely review I'm glad your family enjoyed the house and location. Hosting guests like you is a pleasure. Merryland Farm is a beautiful property! This is the perfect place for a getaway in the middle of thoroughbred farms and vineyards. Beautiful views, plenty of room to entertain and great atmosphere. Ellen is a great hostess! Will definitely stay here again! Ellen was a wonderful host and was quick to respond to any questions we had prior and during the stay. The land tucked away in hills and curves, but still seemed relatively local to the remainder of attractions and stores. We truly enjoyed the opportunity and would love to visit again! Thank you Ellen! Boordy Vineyard is also over the hill from the farm. Visit thier website to see the schedule of bands and tasting parties that might coincide with your visit.